Reading two more of Gabi's proposed books for my book club. See below for one long and one short review. This interesting novel begins at a photo exhibition in 1966. 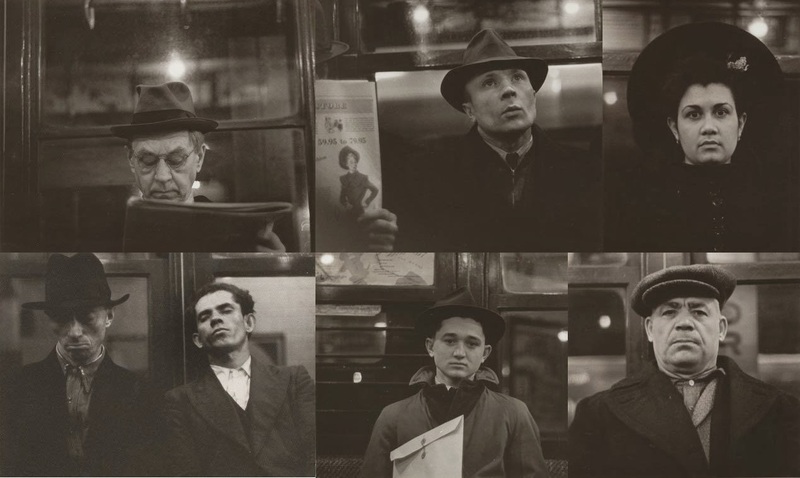 The narrator, Kate, and her husband are viewing portraits by Walker Evans, taken years earlier with a hidden camera on the subways of New York. The book itself includes no reproductions of the works, but I looked it up. Of course they are compelling. At the exhibit, Kate sees two photos of a man she once knew, Tinker Grey, and begins a memoir of the year 1938, during which she had a complicated relationship with him. Of course Kate and Tinker are both fiction, though the photos really exist. Among other things, the book is very visually oriented. Tinker Grey is a wealthy banker, while his brother is an impoverished painter trying to capture some element of the reality of urban New York life, from the jazz scene to the lives of the down-and-out. 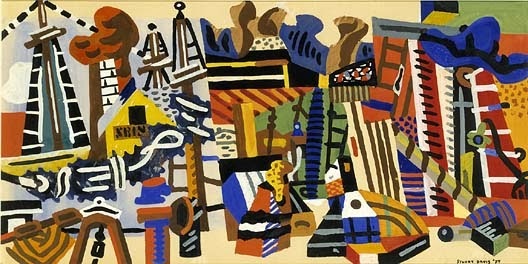 The artist brother owns a number of works by Stuart Davis, whose style I think he's supposed to imitate. I wish the book had included some reproductions! 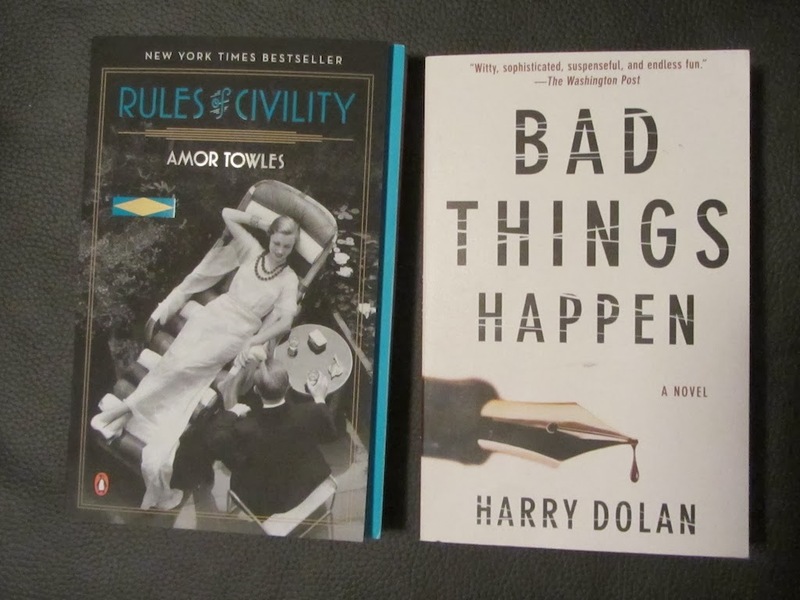 Although I found the book quite readable, I'm afraid that I don't think author Amor Towles lived up to his goal of re-creating the life of a young woman in the New York 1938 world of publishing, high and low society, jazz clubs, funky diners, former speakeasies, delis, automats, fine restaurants and hotel dining rooms, doorman-guarded apartment buildings with private catering staffs, and fast company. In some ways the descriptions of all these New York 1930s places and characters seem a little too iconic, too perfectly compliant with the stereotypes of that era. A few contrasting scenes in wealthy families' country retreats with 20 bedrooms and luxurious living areas seem even more remote and stereotyped. Though there are many period-evoking descriptions, ultimately I think Kate's sensibilities were more representative of the 21st century than of 1938. The NY Times Review puts it this way: "With this snappy period piece, Towles resurrects the cinematic black-and-white Manhattan of the golden age of screwball comedy, gal-pal camaraderie and romantic mischief .... With Katey, we travel by cab and watch Broadway 'slipping by the windows like a string of lights being pulled off a Christmas tree,' or see limousines idling in front of the 21 Club, smoke spiraling from their tailpipes 'like genies from a bottle.' These pages prompt recollections of movie scenes stamped so deeply on the psyche that they feel remembered: elevated trains, Carole Lombard and Jimmy Stewart, smoky jazz clubs and men in fedoras. To call such images clichéd would be to call youth clichéd, to call Manhattan itself a cliché." The character Tinker Grey, a man who created a very different identity for himself than the one he inherited from his family, is depicted in contrast with the upper class men and women who live very much in their society milieu. His life is also shown in comparison with the narrator's own struggle to define and improve her own situation: she was the child of Russian immigrants from a lower class neighborhood. In the course of the year 1938 she overcomes her background and makes it in the competitive world of publishing. Tinker and Kate are also shown in contrast to Eve, a character who comes to New York to escape a rich family from the midwest, has a kind of fling with Tinker, and who eventually runs away from Tinker and from New York itself. A somewhat less-well-developed character named Anne Grandin is in the background of every essential event in the book. In the end, the story that emerges about their personalities and interactions has some rough edges when it comes to plausibility. But it still does read well. This will be a very short review to follow the pretty long one. Bad Things Happen is a mystery story set in Ann Arbor, that is, all around me. Our local restaurants, bars, streets, neighborhoods, campus buildings, shopping centers, city hall, and highway locations all play a role in the story -- even Borders' Books and the Ann Arbor News, which have both disappeared since the book was published. Though the book starts out a bit slowly, the last 50 pages or so are really suspenseful with lots of surprises, so it's a satisfactory mystery, well crafted. It might make a fun read for book club, especially because of the setting. I've been interested in reading books by local authors but you are right -- and I must pass this on to a friend who writes and sets his things near this area -- landmarks can disappear. Sometimes it is best to change the names so they ARE fiction instead of obsolete. Rules of Civility sounds extremely interesting to me, topic and period wise. I might give that one a look.